It is not a scandalous thing to admit that while cosmetics can enhance our natural beauty, they can also make our skin look bad in the long run, especially if we have to put them on almost every waking day of our lives. However, concealers and lipsticks and blushers are like necessary evils to touch up our facial assets or cover up the eye bags earned from working through the night. So, if we cannot get rid of them, what do you say to changing brands and favoring MyChelle Dermaceuticals instead? With this brand, not only will you get healthier beauty products, but promo gifts as well, like this branded canvas make-up bag below. What Kind of Compensations a Brand Gets from Gift with Purchase? Increase in Earnings. The promo gift can help the brand gain more bucks, as women who are devoted to cosmetics are often in need of more make-up bags. It also helps that it’s made out of canvas material, since that is easy to carry. Shows the Brand’s True Colors. When we say that it shows the brand’s true colors, it signifies that MyChelle is silently telling its possible clientele that they care for them so much. They demonstrate it through the convenient gift with purchase. Helps the Brand Become More Widely Accepted. Isn’t it like a unspoken agreement among neighbors, friends and relatives that when one of them moves to a new house or celebrates a special occasion, the others come bearing gifts? 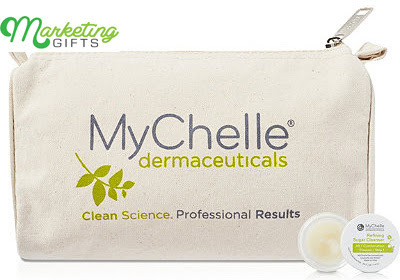 This is how the branded make-up bag can help MyChelle become more known and accepted by their target market. Don’t wait until you’ve run out of ways to promote your brand before you check out the promotional ideas at the Marketing Gifts blog.